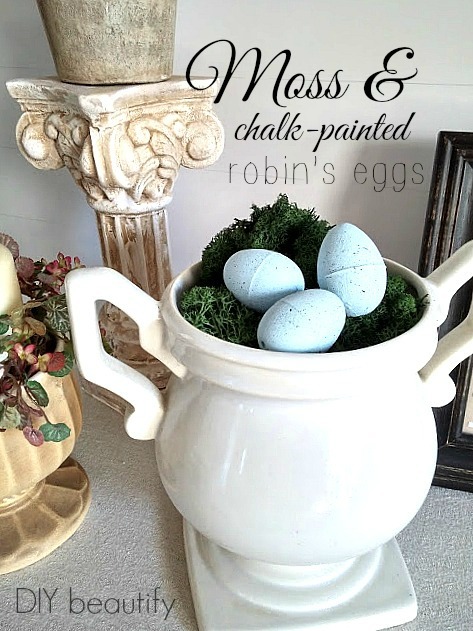 Turn bright plastic eggs into look-alike robin's eggs with a little chalk paint! This project is a total copy cat! What?!? You thought all my projects were originals? Ha! That's why I follow so many blogs myself and am active on Pinterest. The inspiration (and motivation) provides endless boosts to my own creativity! 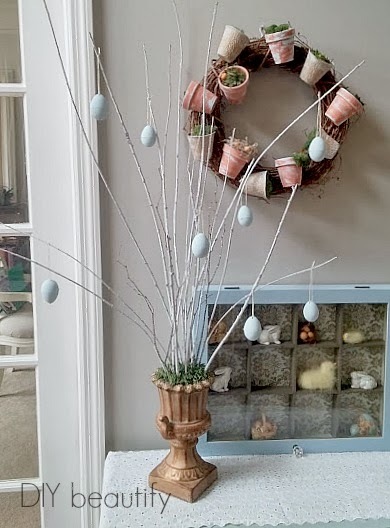 You might remember seeing almost this very same Easter tree when I shared my post highlighting several Inspiring Spring Project ideas from around the web. 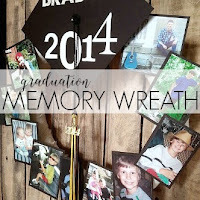 If you can't remember or missed that post...go check it out. There's a reason I selected that tree idea in the first place. You see, for some crazy reason, last winter when Mr. DIY trimmed our trees, I was in the garage spraying a handful of branches white. Those white branches have spent the better part of a year holding their own in a pretty vase in my piano room. 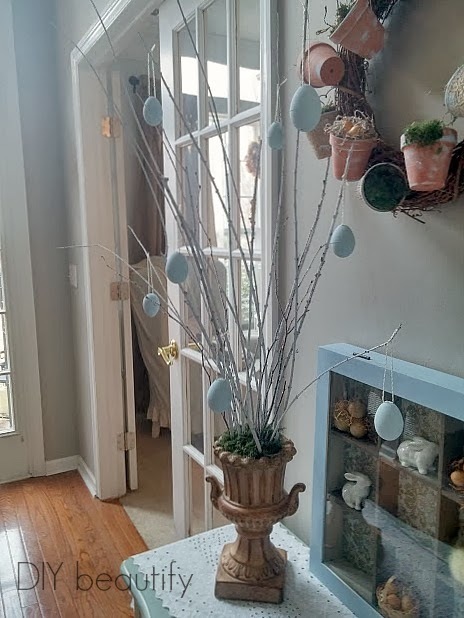 So I was totally inspired to use them to create my own Easter tree! I already had the urn. I found that at Goodwill a few weeks ago. It's a nice heavy one. I put a flower frog inside it and poked the branches down into it so they would be held in place. So far so good. 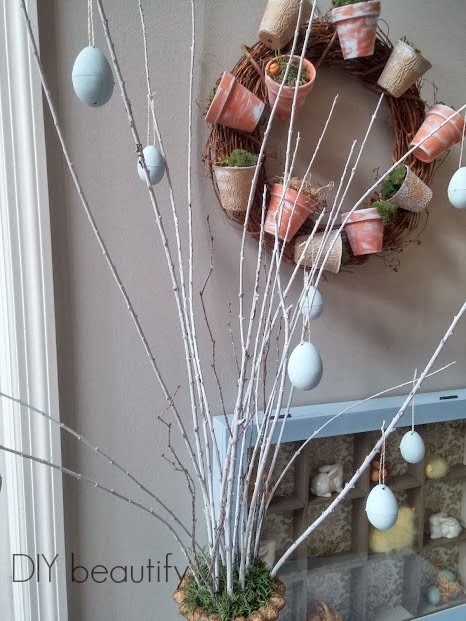 I had leftover moss from when I made my Flower Pot Wreath, so I tucked some of that around the base of the branches. Looking even better. This is almost too easy! All that remained were the eggs....I'm not sure where the eggs came from in the original post. I had some small plastic Easter eggs (you know, the kind that open up and hold a treat). I decided to paint them with chalk paint just to see how they'd look. 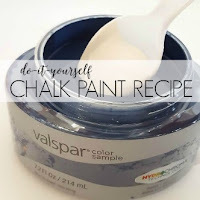 I mixed up a pale blue batch of DIY chalk paint...here goes nothing! The first coat was streaky...I inserted a wood skewer into one of the holes in an end and poked that into a jar to hold them while they dried. Coat #2 went on much better and I could tell this was going to work! 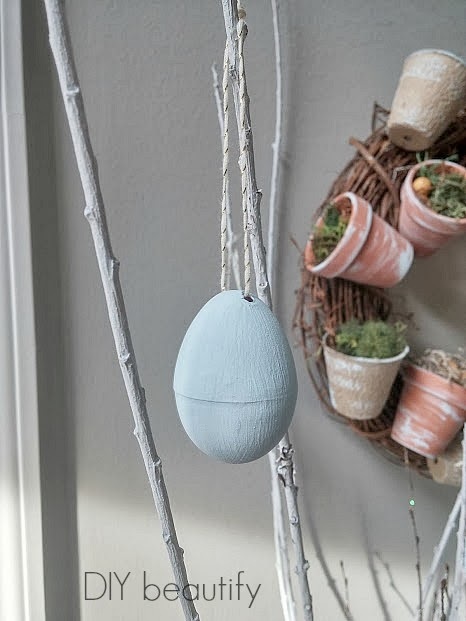 Once the eggs were dry, I used a big needle, threaded it with embroidery thread and poked it through the holes in one end, knotted my thread and hung those babies onto the painted branches of my tree! If you get really close to them, you can see the break line across the middle. But they look SO good!!! 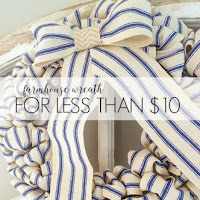 And at about $.10 each, the price cannot be beat!!! 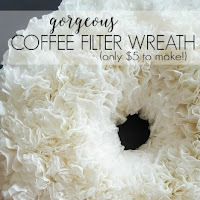 I made some more and can't wait to show you how I used them in another spot in my home. I love the soft colors! I tell ya, this was the easiest tree I ever planted :) Better yet, no watering is involved!! 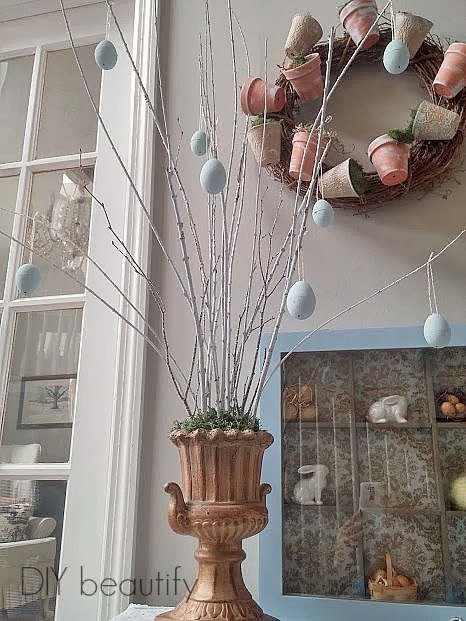 The extra eggs were displayed on a bed of moss in this ceramic urn. Who knew plastic eggs could look so great. 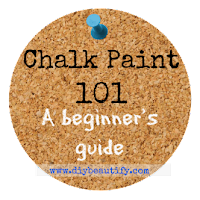 What's the strangest thing you've ever used chalk paint on? I'd love to hear about it!! This turned out really pretty. 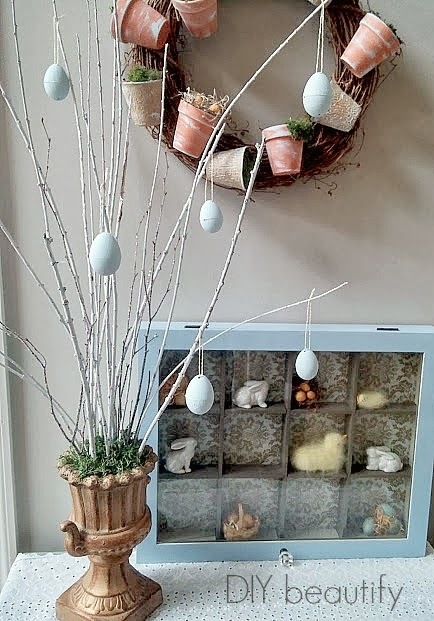 I love painted twigs anytime and with those handmade eggs, it is lovely. Thanks for the inspiration! I'm surrounded by trees but yet I have a hard time finding ones that look right. I love those eggs and the tree! 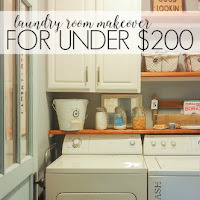 Thank you; easy too ;) Those are my favorite DIY's! So pretty and ready for spring! I have a big bag of those eggs and have been thinking about painting them! Thank you Sharon, it is fun to be getting ready for spring and the eggs turn out remarkably well :) I'm ready for warmer weather to stick around!! 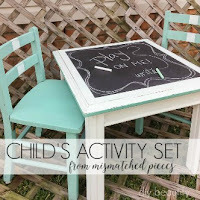 Such a cute set up--everything! Thanks Stephanie :) Glad you like! I really like the soft pastel color. I love urns and have plans to make a tree in one of mine. Thanks for the inspiration and for sharing with SYC. 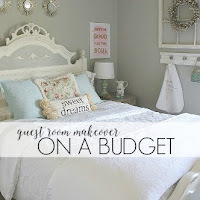 Thank you for sharing your cute thrifty Easter decor at my party. Luv those DIY eggs. You will be featured at this weeks party. This is definitely awesome! Even though it is a copycat, I love that you make the tree more attractive! I definitely make one of this Cindy, the blue eggs is cute! Amazing!